Ferns are often found among green abundance in forests of all kinds. They tend to be happiest in mossy and wet areas. Although Fern itself does not flower or produce strong scent it is the surrounding earthy environment which is associated with this scent. A separate category of sweet mossy fragrances named Fougère is dedicated to this unique aromatic character. 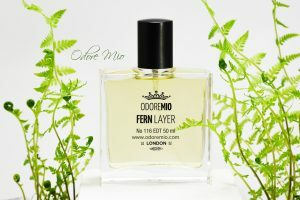 Fern Layer from Odore Mio offers classic uncompromising blend of sweet forest meadows, wet mossy wood logs and earthy blends of woodland notes. As with other fragrances in the “layer” category this Fern can be worn on its own or used as additional or finishing touch with other fragrances. It will add depth and sophistication to any floral, citrus or woody fragrance. Mossy notes tend to be longer lasting, offering that lingering bitter sweet sensation of deep forest.